When contractors began a 5 month project around an office building which was still occupied by workers, they looked for a clear scaffold sheeting that would allow the maximum amount of natural light into the building. Completed in 2010, Vantage Point is a 10 storey, 37m (121′) high office building located in the prestigious Spinningfields area of Manchester City Centre. 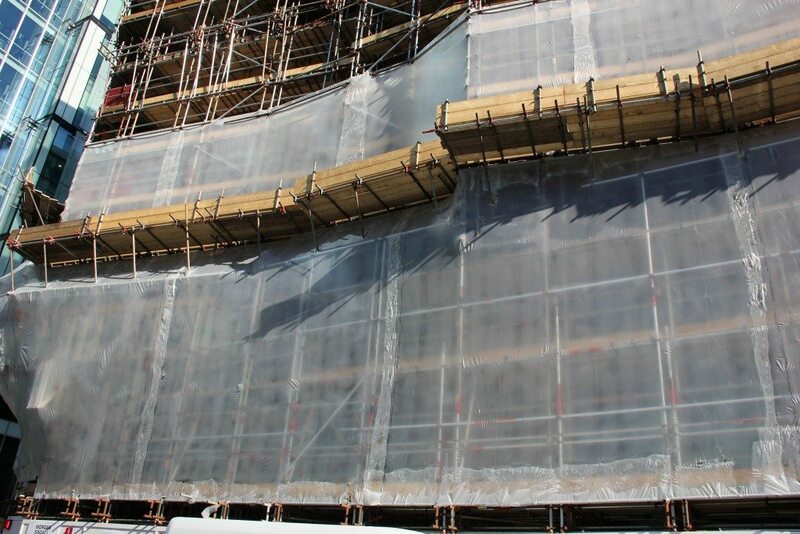 In March 2016, the construction contractor requested a shrink wrap scaffolding encapsulation to provide temporary weather protection for their contract which was to involve working on the entire facade of the building over 4-5 months. For this project, the main reason for choosing shrink wrap was for the smart appearance of the sheeting. 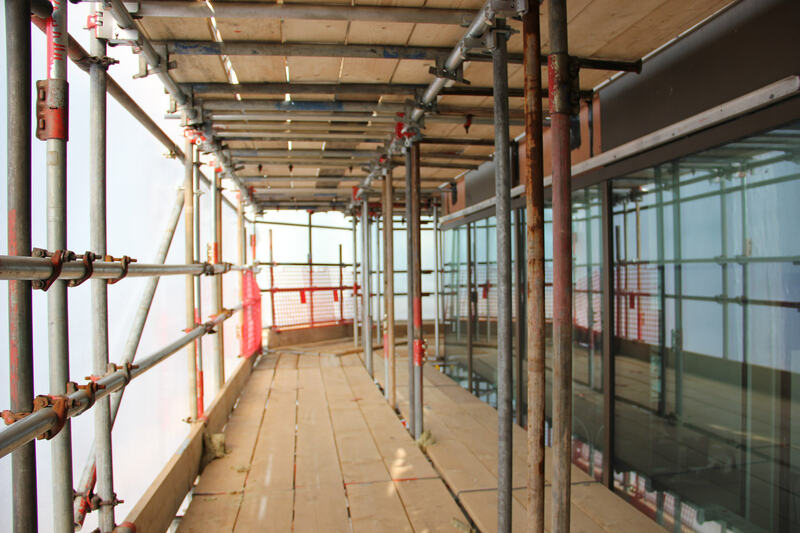 Because Vantage Point is a landmark building in a very prominent location in Manchester City it was felt that shrink wrap would look much better than traditional scaffold sheeting. Also, Vantage Point is not a simple ‘box-shape’ building but has a complex shape. The scaffolders did a very skilful job erecting the scaffolding around the many ‘kinks’ and returns in the building facade and the Rhino shrink wrap installation team worked closely with the scaffolders to ensure that the scaffolding was set up in the best way for shrink wrap sheeting. The majority of scaffold wrap jobs that we install or supply materials for are completed using a white shrink wrap film. Although white scaffold wrap does not noticeably ‘block’ light, the contractor required that as much light as possible be allowed through the sheeting so that office workers who will still working in the building throughout the construction projects, did not feel ‘enclosed’ by the scaffolding and sheeting. Manufacturing a clear shrink wrap film is easy, manufacturing a clear shrink wrap that is ‘construction grade’, i.e. at least 250 microns thick and flame retardant is much harder because the flame retardant additives tend to make the film have a milky or hazy appearance. However, at Rhino we stock a clear shrink wrap scaffold sheeting that is also flame retardant to the EN13501 specification. Of course, if clear scaffold sheeting is used it is also essential to use clear shrink wrap tape and clear zipped access doors if required.